Here, we will have a look at the best golf grips for the persons who have sweaty hands. Even though all the products here are specially filtered for the slippery hands, you can have them for getting a confident grip in heat and humid weather. You are a golfer and want the best kit for the sport, that’s not an exaggeration. And nowadays, there are a lot of products in the market available which help you to have your best shot. A golf grip is one such thing that is one of the essential parts of a golf kit. After some time of usage, the grip becomes slippery and wears down. So you need to replace the grip for precise control. But, you need to be careful while picking up the golf grips, especially when you have sweaty hands. So, the perfect grip is the most important thing for having your best shot. Check the product reviews here and compare the size, length, grip style, your budget and comfort to get the right fit for your hands. What are the Best Golf Grips? 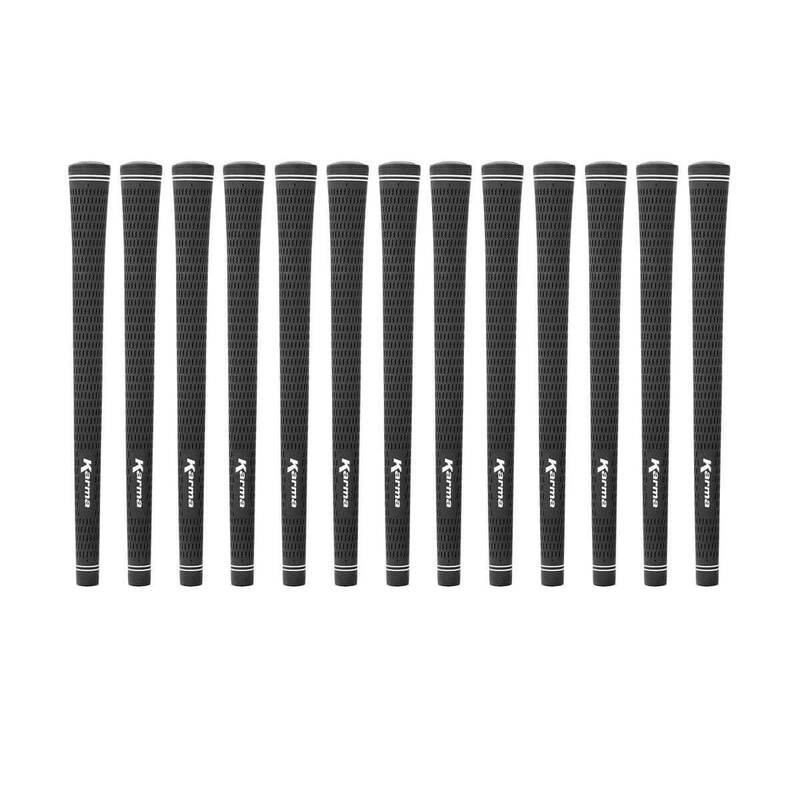 The Dritac golf grips from Winn are available in seven different colors and various sizes. It has a classic wrap style design which will provide great comfort to your hands and mind too. It has different weights of grips like 28g, 35g, 48g, 49g, and 50g which helps to get the best fit according to your body style and hand grip. It is highly shock & moisture absorber design which is great for wet weather and sweaty hands. The WinnDry Polymer material is used for the cushioning to make it non-slippy and flexible to use in all types of weather conditions. It is easy to put on the club and require less than one hour to make an entire set of your golf clubs. You can use it on both the iron and the drivers. It also fits right on children’s clubs. From Karma, you will get a total of 13 pieces of golf grips to handle your set of clubs. Check the characteristics and price of this dominant grip styles and get accurate shots while you play golf. All the grips are available in five different colors including black, black/white, blue, pink, and white. Each package you buy will include 13 pieces of grips which are enough for your club set. 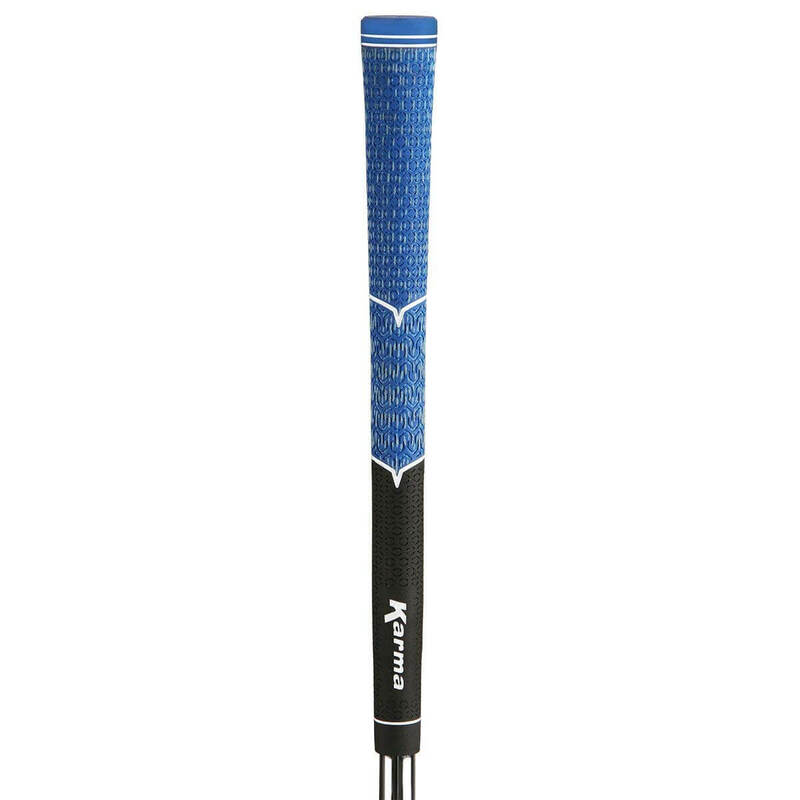 The grip pattern has a classic look and is tested for the firm control of the club. You can select the suitable size of the grip from standard, junior, ladies, midsize, and jumbo. Each grip has a size of approx. 10 3/8 inches. SuperStroke provides the non-slippy putter grip to help you have the best shot while putting. Though it is perfect for sweaty hands, its lightweight and flexible design make it suitable for any kind of hand grip style. The outer layer is made from the tacky polyurethane material to provide a superior grip on the club. There are seven different types of colors to choose your favorite putter grip. It has a diameter of 1.30” and comes with a ‘Super Stroke Technology’ to help you have consistent performance in golf rounds. The EVA foam in the grip will provide more comfortable holding feel of the club. It has a length of 10.50 inches and is USGA approves. 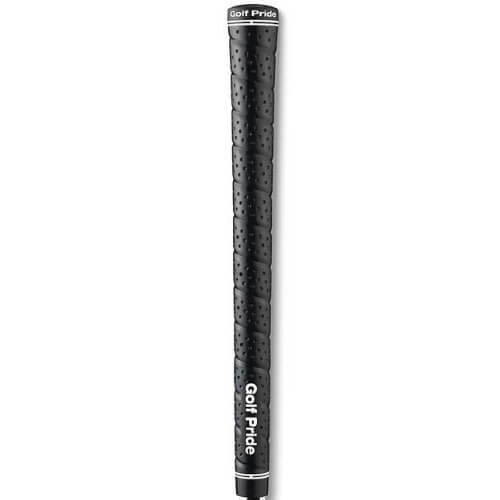 This 2G grip from Golf pride is made from the high tack rubber & leather which provide durable performance. You will make an ultimate impact on the ball with the help of this one of the firmest grips from the company. You can choose from three different colors including black, blue, and white. It is available in sizes like 0.60 standard, midsize, and standard. The grip weights 50 grams which will provide firm holding of the golf club. The softer material of the product will give improved feel while you are giving your shot. The tacky rubber gives the best performance in all types of weather, especially in wet weather. The V-Cord type golf grips from Karma are flexible to use in all types of weather conditions. Compared to other standard grip brands, it delivers more traction. Try this grip, and I am sure that you will not regret your purchase. The grip has a weight of 51 grams which is a standard for a good grip. It has a round shape, and available is standard and core sizes. You can choose from pure black, black/blue, and black/red colors. The upper half of the grip is corded, and the lower half has a soft rubber in it to provide superior comfort in your hands. You can use it in all types of wood, irons, and wedges. It is available in both the black and blue colors, so you can choose the one you like. It has a standard grip size with 0.580 inches of core size. The round full corded grip type provides superior comfort and feel. It increases traction and eliminates moisture with the help of full cord fabric. It controls the torsion and absorbs the vibration to help you making longer, robust, and consistent shots while you play golf. You will get comfort in all weather conditions and handgrip styles, especially in a humid environment and sweaty hands. This MCC Plus4 grip is quite popular, mostly among the pro golfers. The Golf Pride made a tour-proven, hybrid designed grip with softer material and high precision. It will deliver consistent grip control in all golf rounds for a longer time. It helps to increase the power & control and reduces the tension & vibration while you use it on your club. There are five different colors available to help you choose your favorite. It weights 52G (with a variation of +- 3g) to provide you with a firm grip. The upper hand of the grip has BCT cord material, and the larger lower side has a compound material of soft rubber. The MCC Plus4 gives you an accurate control and feel even in the wet conditions and slippery hands. Well, it depends on the weather condition and your body style. To understand the better grip, let’s see the types of holds and their usage. With the moderate texture of the surface, these grips are versatile to have control over the high moisture. It is recommended to use such grips when you are hitting the golf ball to the faraway hole. They are comfortable to hold and provide more power. Such kind of grip is perfect when you are putting. With the more extended size of length compared to the swing grips, the putter grips will help you to hold the club firmly. Due to the slight bend shape, you will have a smooth and real control for the excellent putting. Such types of grips are used mostly for the training purpose. Also, the beginners use the specialty grips because of their strength and power generating designs. They help to improve the performance with a mighty swing and firm control. Not only these, but the hand positions also matter for a precise and accurate shot. Check the below hand grips that are most common and useful. It is also known as Vardon overlap grip. For the newcomers, this grip style is the first to learn. It was invented by the six-time British Open Champion, Hary Vardon. 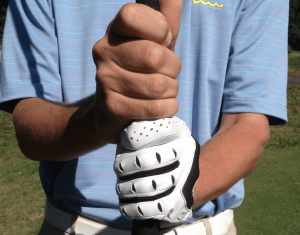 If you have strong hands, then the overlapping grip will help you to send the golf ball fairway. 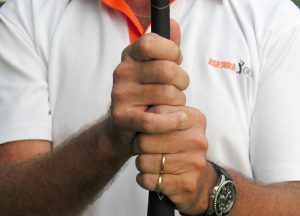 The professional and top-rated golfers like Tiger Woods use this type of hand grip when they play golf. Even women golfers who generally have small hand sizes are recommended to use this hand grip style. This grip style will hold your hand interconnected and will create more power. Many people also know it as a baseball grip style. It is recommended for the golfers who do not have steady hands. 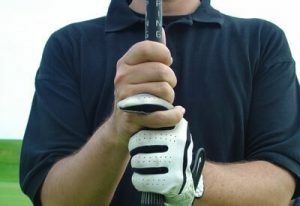 In this grip, all of your ten fingers will be on the club, and thus you will get extra power from your wrists. It will give a create a less control over the club head though. It doesn’t matter whether you are a beginner or a pro golfer, whether you are a professional or playing golf to stress out; you need to give your best to it. After all, it is one of the most famous sports in the world (and my favorite). When we look for the perfect grip for the slippery hands, then the products mentioned here are the right options to choose from. Check your budget, your hand grip style, and then get the perfect product from the list.